an housewife Bui Thanh Truc is afraid to travel by air in view of the many recent plane crashes, which have only intensified her apprehensions about flight safety. The 35-year-old said she would prefer to travel by train, car or ship instead. "I have an upcoming five-day holiday in HCM City, but perhaps, I'll go by train," Truc said. TruF9c also wrote a comment on Facebook about wanting to avoid a plane journey, which quickly received a lot of responses from her friends. One of TruF9c's friends said that if she did not have something necessary or time-bound to attend to, she would not fly. "Earlier, I had cancelled a tour to Malaysia," Truc added. "I won't travel by plane anymore." "Moving on the ground is safer than flying in the air because people can stop the train, bus or ship if an accident occurs, but you cannot do that with a plane," TruF9c said. Forty-year-old Nguyen VaEAn BECnh said his wife was also afraid of stepping on to a plane for travel. "My wife bought a plane ticket to visit HCM City following a week's leave in Nha Trang. However, she said she would only go by train. She was very concerned about the recent plane crashes," BECnh said. TruF9c and BECnh's wife's anxiousness was a result of the recent Germanwings passenger jet carrying 144 passengers and six crew members crashing in a remote area of the French Alps as it flew from Barcelona to Dusseldorf on March 24. All the people on board had died. According to the Bureau of Aircraft Accidents Archives of Switzerland, there were 111 aircraft accidents last year, including the MH370 and MH17 flights of Malaysia Airlines, which led to 1,320 deaths. This data does not involve helicopter crashes. 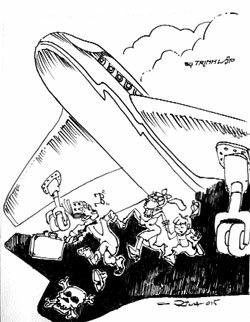 According to Luong Hoai Nam, an experienced staffer for a domestic airline, people's uneasiness and feelings about recent air crashes were a spontaneous reaction to the awful aircraft disasters. Reports of these incidents also drew far more comments than other traffic accidents. "When their emotions quiet down, people should look at the following figures to see whether air travel is safer or not than other means of transport," Nam said. US data showed that scheduled flights have a death rate of 0.003 fatalities per 100 million passenger miles. In comparison, commercial buses have a fatality rate of 0.05 per 100 million passenger miles and passenger trains have a rate of 0.06 for the same. Road travel is again considered the most dangerous mode of transportation, the report said, with its fatality rate of 0.61 per 100 million passenger miles. On the other hand, air travel is safer than walking. Traffic-related pedestrian accidents account for 1.58 deaths for every 100,000 people, according to the US Center for Disease Control and Prevention. Data also indicated that the risk of death for passengers of commercial airlines is one in 45 million flights. A traveller could fly every day for 123,000 years and still feel safe. "Although aircraft accidents occur repeatedly, commercial airlines are the safest mode for transportation. I believe it is true because I worked for many years in the aviation business and have travelled by air frequently," Nam said. He added that people's perception of travel by land to feel safer than by air was not based on any scientific foundation or reality. It was only a psychological feeling. Nam explained that when travelling by car, train or ship, you committed your life to the rider. Stopping on time (when the crash was about to happen) did not depend on you, but on the driver. In most accidents occurring on land or at sea, passengers had failed to recognise the imminent danger and act in a timely fashion. Most passengers only knew they had to act after the accident had happened. In some cases, the passengers did not even get a chance to realize this as they had died instantly. Meanwhile, aircraft accidents occurred because of many reasons, such as bad weather, technology, a pilot's error or an attack, Nam said. But almost all these reasons related to people's mistakes. A plane could encounter a technological problem while it was flying, but if the pilot tackled it correctly, the consequences could be prevented or mitigated. Looking back at some domestic commercial aviation agencies, although they had reported some insufficiencies in terms of services, as well as delays taking place regularly, no serious accidents were reported during the past many years. According to the Viet Nam National Traffic Safety Committee, in 2014, there were 25,322 traffic accidents, causing 8,996 deaths and injuring 24,417 persons in 2014. These accidents had mainly been caused by motorbikes or other motor vehicles. FPT Software Chairman HoaF8ng Nam TieE1n, who often travels by air, said that even though the recent air crashes had occurred in quick succession, flying was still safer than driving or walking in HaF8 NoE4i in particular, and across the world in general.